INCONSISTENT AND UNINSPIRED, THEIR WORST TILL DATE. 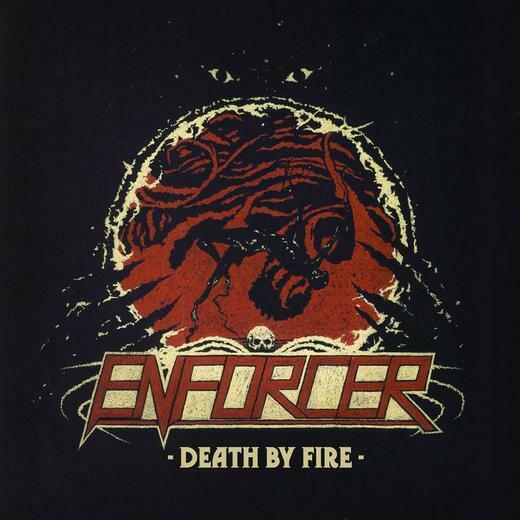 Enforcer is a Swedish heavy/speed metal quartet that has gained quite a following with their take on old school heavy and speed metal. Though they lack highly on originality the bands’ two albums entitled ‘Into The Night’ and ‘Diamonds’ has received much praise because of the inherent quality of the traditional old school sound. ‘Diamonds’ especially was an album which was considered a gem in the New Wave of Traditional Metal, caught my attention and launched the band to the top of modern metal food chain due to the bands youthful energy and passion that bled profusely. The band sounds like a mixture of the speed metalesque youthful energy ‘Kill ‘Em All’ era of Metallica, melodic sensibility of ‘Cryptic Writings’ era of Megadeth and instrumentality of ‘Somewhere in Time’ era of Maiden meshed together with the power and choppy riff thought pattern which is reminiscient of early Angel With and Judas Priest. Fast forward to 2013 the band released their third album which has been entitled ‘Death By Fire’. Like on the previous releases the album art, title and song tracks are all very 80’s.. Unlike previous releases the band has this time added influences from the fluffy cheesiness of power metal like on ‘Run For Your Life’ and has also added the glam metal quotient with certain choruses like the ones on ‘Take Me Out Of This Nightmare’, ‘Satan’ and ‘Sacrificed’being reminiscent of Motley Crue and Quiet Riot. I feel that the band could have done away with these elements as they don’t seem to suit the bands personality and contribute greatly in the final result which is a rather bland release. ‘Crystal Suite’, a 4 minute instrumental track is essentially history of the guitarwork of Maiden with the track opening with an early Maiden riff slowly moving onto a ‘Seventh Son of a Seventh Son’ melodic portion and also containing a ‘Dance Of Death’ type solo. Also, the previous releases revolved a lot around Olof Wikstrand’s high pitched over the top vocals, but this time the axe work has taken center stage which is not exactly the best trade-off since Olof is brilliant vocalist, his voice suiting the band note for note. He added a completely new dimension to the bands’ sound with his John Gallagher (Raven) and John Cyriss (Agent Steel) type vocals because you could feel his passion which added a youthful energy to the whole band. After the title track the band seems to lose its way completely by churning out material that is boring, uninspired and highly inconsistent. The riffs seem rehashed, the vocals sparse and the solos badly constructed entering one year and leaving out the next without leaving an impace in between and in the process not giving anything with any playback value whatsoever. However, not all is bad. Roped in by Nuclear Blast the production is not over produced but pristine and the plodding bass lines and drums can be heard well behind the guitar work and powerful vocals. The band still does possess the energy and love for the 80’s. Also all tracks leading upto the and including the title track are great songs. The masterful guitarwork and blazing solos on tracks like ‘Sacrificed’, ‘Satan’ and ‘Mesmerized By Fire’ really worth listening. All in all this is the weakest release from the ‘Enforcer’ catalogue till date. They have never been original but always had the passion to leave a mark on the music they deeply love but here they seem to cover up for the lack of even that inkling of creativity by adding power and glam elements to their music which ended badly the band falling flat on its face. Highly inconsistent apart from the first 3 tracks and moments in between this album is possibly worth a solitary listen. If you ever need a dose of NWOTHM listening to this bands’ previous releases will be a better idea.